Welcome to Tom Clancy’s Ghost Recon Wildlands, a co-op, tactical, open world, first/third person shooter developed by Ubisoft Paris. 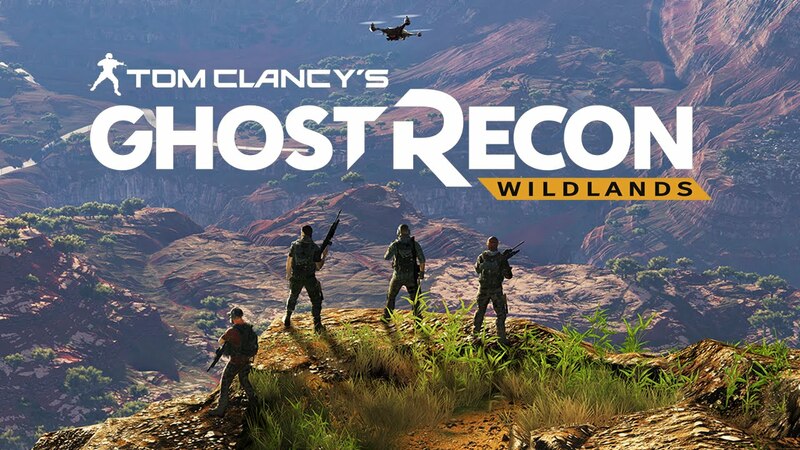 The best way to describe this game is that it feels like a Just Cause 3 clone (without the chaotic and zany features), with co-op mechanics from The Division, and shooting and stealth mechanics from previous Ghost Recon entries. In this stage you’ll want to go for beating all the main story missions. There are usually 5 – 6 main missions in each region. You can do any region you want from the beginning of the game. So if you want a challenge, you can go to the difficulty 5 regions and finish them first to get massive experience. It’s suggested that you play through region by region and finish all the main missions in them. You can play the entire game solo or co-op. Just play and enjoy the game, and do not worry about any missable trophies as there are none. You can always replay missions that you have completed to access specific parts that might help you get specific kill related trophies. After the beating the main campaign and all main missions, you’ll be put back into the open world to complete all side content in the game. This is where most of your time will go into, as there are a ton of collectibles, as each region has anywhere between 30 – 40 collectibles you will have to collect. There are trophies for all the collectibles except for weapon modifications/accessories. These are there to enhance your weapons, and not needed for any trophies. All collectibles except documents can be revealed on the map by interrogating people that might have intel, or by reading intel documents. The only collectibles that you’ll have to roam around for are the documents and legends. Both Documents and Legends are usually in named locations or locations you haven’t yet visited (marked by a “?” mark). For efficiency you can take a helicopter and fly relatively low and go to each of these named locations. When you’re nearby these documents and legends pop up on your map. Now you could try doing side missions while you collect these collectibles, but for efficiency its better to focus on one thing at a time. In this step you want to do enough rebel ops missions to increase your rebel support skills to max level. While doing this you should also do one of each type of other side op missions to get the Spice of Life trophy. You also want to buy all the upgrades for all the skills in the game, and reach max level (30). You will undoubtedly reach level 30 while going for all other trophies. At this point you might have a few kill related trophies, sky diving, etc, left. You can also get your co-op related trophies now if you’ve been playing solo the entire time. This is the point to get those miscellaneous trophies and achieve your new grindy and shiny Platinum trophy. Note: You may unlock any of these miscellaneous trophies in the other steps just as you are playing the game naturally! Acquire all other trophies to obtain this shiny new platinum! To get this trophy, you need to buy the parachute skill under the Items skill tree. Now you can either, fly a helicopter, or a plane high into the air and jump out to perform a skydive. Once you are close to the ground, activate your parachute to land safely on the ground. Repeat this 9 more times and the trophy should unlock. You can find helicopters and planes in many enemy bases, or in rebel ops side mission. You can leave this until you get the rebel support ability to summon helicopters. You need to get the Rebel Support skill the Mortar shot for this trophy. This skill unlocks automatically when you finish your main missions in the first region of the game (Itacua province). You cannot miss this, as this mission is mandatory for the story. Now trying to hit an actual airborne and mobile helicopter is almost impossible as it will always move too fast. The mortar shot also takes a few seconds to even land. So the best way to do this is to go to one of the rebel op missions that involve you to steal an enemy helicopter. Shoot at an enemy to alert all the enemies, and wait for an enemy to approach the helicopter. As soon as you see an enemy open the helicopter door, call in a mortar strike (By holding R1 and pressing X) on the helicopter. As the helicopter is rising vertically in the air, it should get shot down. This trophy is worded poorly. You don’t need to drive 100 km in a single car. This is cumulative with all the vehicles you use. You definitely don’t need to farm this as you will be driving a lot to many of these missions, objectives, and collectibles. You’ll probably end up having more than a couple thousand kilometres when you’re done with everything else. You will unlock this trophy far before you even get the ability to summon helicopters with your rebel skill for a vehicle drop. Sources are people that have information during many main missions in the game. Also there are sources you can interrogate in all regions. You can even interrogate them to show locations for the collectibles. They count for this trophy as well. There are more than enough sources to get this trophy with. By finishing all the main missions you will have interrogated more than enough sources to get this trophy. See the trophy The Whole Story for more information. Documents are a type of collectibles in the game and are part of the Kingslayer files. They are marked on the world map with a white paper icon. Unlike other collectibles, you cannot see them on the map by looking at intel in the open world. The only way to get them to show up on the world map, is to be relatively close to them. This will trigger the documents to show up on your map. The best way to get all these collectibles to show up is to take a helicopter and fly relatively close to the ground and visit all named locations and locations with a “?” mark (locations you haven’t visited). Documents can be found in many locations such as cities, enemy bases and outposts, small camps, gas stations, villages, farms, etc. They can be found pretty much anywhere that is a named location. There are reports that people are earning the trophy before getting all of the documents. I personally unlocked it when I still needed 7 more documents. This is quite lucky as some people still needed to collect every document before the trophy popped. Another huge problem with the documents is the tracker/counter for how many you have collected. Some regions will have less documents that the tracker would show it to be. For example with my game, In the Media Luna region my tracker kept saying 9/10. But I couldn’t find anymore documents in that region. The document was in another region. Keep that in mind when going for this trophy as if you cannot find the last document in a region, move onto other regions and come back. You may pick it up in another region. This is an automatic story main mission unlock. It’s unmissable. Following the main missions you will be tasked with locating and eliminating La Yuri Y El Polito who together are the Buchons of the Itacua province. Once they are both down, the trophy will pop. You can complete this in the Solo Campaign or in co-op. If you complete it co-op you do not even have to be the one who fires at the bosses to earn this trophy. This is an automatic story main mission unlock. It’s unmissable. This trophy will unlock upon completion of all main missions in all regions, after killing all bosses, and finishing the final mission. This is an automatic story main mission unlock. It’s unmissable. This trophy will unlock for completing the Smuggling operation as part of the main story. This is an automatic story main mission unlock. It’s unmissable. This trophy will unlock for completing the Production operation as part of the main story. This is an automatic story main mission unlock. It’s unmissable. This trophy will unlock for completing the Security operation as part of the main story. This is an automatic story main mission unlock. It’s unmissable. This trophy will unlock for completing the Influence operation as part of the main story. This is an automatic story main mission unlock. It’s unmissable. You’ll obtain this trophy for completing all main missions, and beating the final mission. This is a simple trophy. It requires you to kill a sniper with your pistol. You come across many snipers in the game. They are usually located in towers, and sometimes on top of buildings. Equip any pistol, run up to them, switch to your pistol by pressing Triangle twice, and shoot the sniper. Once the sniper is killed the trophy will unlock. You need to be online for this trophy and have to play in coop with atleast one other person. You can join random people from the lobby menu, by pressing the touchpad and pressing L1. For a better experience I suggest playing coop with your buddies by joining their game or inviting them to your game. Now complete any 3 main missions to get this trophy. If you have finished all main missions, don’t fret, you can replay missions by highlighting a region and pressing triangle. This should open up the main mission list for that region. Once you finish your 3rd mission with your coop partner, this trophy should unlock. This is an automatic story main mission unlock. It’s unmissable. Amaru’s rescue is the first main mission you can complete in the main story campaign. Amaru is Pac Katari’s uncle and is the ideological leader of the rebel movement. He has been taken captive by Santa Blanca. Your ghost has been tasked with returning him to Pac Katari. This mission involves four objectives and acts a basic tutorial. You will also have your first opportunity to interrogate your first source which will begin the tally of 20 sources interrogated for Deadly Curious. To earn this trophy, simply complete this mission. It can be completed on any difficulty level and in co-op or Solo mode. The drone can be deployed by pressing Up on your d-pad. Now move the drone around and look at enemies. The drone will automatically tag enemies who are close. It’s suggested that you upgrade the range, and the ability to easily tag enemies to help with the trophy. You should be in the habit of using the drone to tag enemies every time before entering an encounter with a lot of enemies. This should come naturally if you use the drone all the time. It can be farmed at enemy base camps, if necessary. This is similar to tagging with the drone. This time you have to press Down on the d-pad to access your binoculars. Use the binocular and press R2 to zoom it. Tag a 100 enemies and this trophy should unlock. You can buy the zoom upgrades for the binoculars to help make this easier. If you use the binocular regularly, this trophy will come naturally. It can also be farmed at enemy base camps, if necessary. You need to unlock the C4 skill in the Items skill tree. With the C4 unlocked you need to detonate and kill 7 enemies with it. This can be tricky and painful to do if you’re just using the C4. To make things easy, also unlock the Lure and Flashbang skill. With these two extra skills, the trophy should be easy. The strategy is to use the lure to bring enemies into close proximity to each other, then use flashbangs to blind them for a few seconds. This gives you ample time to throw out a C4 and detonate it. Now if you just can’t kill enough enemies with the C4, it may be that the C4’s blast radius is just not cutting it for that situation. Buying the Explosion Radius skill, which is an epic skill, will make this a lot easier. You unlock this by buying each skill once (You do not need to max the skills out). The best spot to get this trophy is in the Deserter main mission located in the Montuyoc Province. At the first objective, there are 7 enemies already in close proximity to each other. Throw a lure to bring them even closer to each other, then throw a couple flashbangs, and throw a C4 and detonate it. This should unlock the trophy. With this strategy, you should get the trophy in 2-3 tries. You need to unlock the Mine skill in the Items skill tree. With the Mine unlocked you need to detonate and kill 7 enemies with it. This is a really annoying trophy as the mine doesn’t have a huge blast radius. To make things easy, also unlock the Lure and Flashbang skill. With these two extra skills, the trophy should be easier, but can still be a finicky. The strategy is to use the lure to bring enemies into close proximity to each other, then use flashbangs to blind them for a few seconds. This gives you ample time to go to the middle and place a mine. Now shoot the mine quickly to explode it, killing you and all the enemies in the process. At least the trophy will unlock! Now if you just can’t kill enough enemies with the mine, its understandable as the mine has a really small blast radius. Buying the Explosion Radius skill, which is an epic skill will make this a lot easier. You unlock this by buying each skill once (You do not need to max the skills out). The best spot to get this trophy is in the Deserter main mission located in the Montuyoc Province. At the first objective, there are 7 enemies already in close proximity to each other. Throw a lure to bring them even close to each other, then throw a couple flashbangs, place the mine and shoot it. This should unlock the trophy. You should be able to get the trophy with the strategy in a couple of tries. Legends are a type of collectibles and are a part of the Kingslayer files. They are marked on the world map with a white scroll icon. Unlike other collectibles, you cannot see them on the map by looking at intel in the open world. The only way to get them to show up on the world map, is to be relatively close to them. This will trigger the Legend scroll icons to show up on your map. The best way to get all these collectibles to show up is to take a helicopter and fly relatively close to the ground and visit all named locations and locations with a “?” mark (locations you haven’t visited). Legends can be found in many locations such as cities, enemy bases and outposts, small camps, gas stations, villages, farms, etc. They can be found pretty much anywhere that is a named location. There are 2-4 legends in each region, so be thorough when searching for these. Make sure to get all Kingslayer files in each region, and this will ensure you will collect all Legends in the game. The side missions in the game are called Rebel Ops. There are a total of 8 different types of rebel ops, and 5 of them upgrade each of your rebel support skills. You can either roam around the map to get these missions to spawn on the map, or find intel locations that you can read to unlock the locations for the side mission. You can also interrogate sources that have intel on the locations of the side missions in that specific region. Just complete one of each of these 8 rebel ops to unlock this trophy. To unlock this trophy, you have stop a convoy, kill the enemies guarding it and then tag the convoy. Repeat this 9 more times to get this trophy. Convoys respawn in all regions. Convoys are also the most effective way to farm resources in order to buy all the skills. If you need to farm this trophy fast travel to the Remanzo Bravo fast travel location in the Remanzo region. Behind you a convoy will always travel along the road as soon as you spawn. Use the EMP ability on your drone to fry the convoy, shoot grenade launcher shells on the armored cars to take them out, and tag the convoy. Once you tagged it, fast travel to the Remanzo Bravo fast travel location and repeat till you get the trophy. See trophy Only the Best for more information. Buying all skills also unlocks the trophies Ultimate Skill, and Top Drone. Now to buy skills, you need skill points and resources (gasoline, health, comms, and food parcel units). You get skill points by finding skill points collectibles in open world, leveling up, killing bosses, and by finishing end game high level story main missions. After completing all main missions and getting to max level, you still will not have enough skill points to get all skills, which means you have to roam around the open world and collect all skill points from each region. This will be a trophy where you’ll be spending most of your time, as not only do you have to roam around collecting skill points, you also have to farm resources. Resources such as gasoline, health, comms, and food parcel units are littered all around enemy camps, named locations, and outposts. But they only give 50-250 units a piece. This is nowhere near the amount you need to be earning to get all the skills. Some of the higher end skills require 10-13000 resource units. This is absurd as finishing all rebel ops in all the regions will take you a long time. Thankfully I found a farming method for resources using the convoys. The best and most efficient spot for farming resources is in the Remanzo region at the Remanzo Bravo fast travel location. Once you fast travel to this location, behind you a convoy will always travel along the road as soon as you spawn. Use the EMP ability on your drone to fry the convoy, shoot grenade launcher shells on the armored cars to take them out, and tag the convoy. Once you tagged it, fast travel to the Remanzo Bravo fast travel location and repeat till you get the trophy. Each successful run gives you 5000 resource units per 1-2 mins. Wolker4 suggested an alternative method for 5,000 resource units per minute, if you feel the previous method was still taking too much time. In this method, you will have to replay the Deserter main mission in the Montuyoc province. Head to the first objective and kill the target. You will fail, and respawn 300 – 400 metres away from the target. Right behind you a convoy always spawns and travels down the road. Well you know what to do! Go grab them juicy resources. Bonus medals are a type of collectibles in this game that give additional boost to skills you can get in the game. They are extremely easy to find as you can get their locations (marked by a star badge icon) to show up on your map, by looking at intel files or interrogating sources with intel. Intel can always be found in enemy base camps, outposts and most named areas in the game. Each region in the game has 1-2 Bonus medals. Once you collect your final one, you will unlock this trophy. See trophy No Better Rebel for more information. Once each of the rebel skill is unlocked, you need to do each of the missions listed above 9 times to upgrade all these skills to max. There are more than 9 of each of those missions, so if one mission is proving to be too troublesome, then go do another one that is easier. Also if you fail, don’t worry just fast travel to a fast travel location and the rebel op will respawn. Once you max out all skills the trophy will unlock, but it might take a few seconds to pop. See trophy Assault Rifle Fanatic for more information. In order to unlock this trophy you need to reach level 30 (max). You need experience to level up, and the one annoying thing about this game is that it doesn’t show how much experience you need to level up. You can get experience points by killing enemies and finishing main missions. You really don’t need to farm this as you will naturally unlock this trophy while tackling the other trophies in the game. If you feel compelled to farm this, you can redo main missions. Choose the ones that just feature a boss fight, and also gives you high amounts of experience. You need to kill an enemy that is 400 m away or greater. I suggest using a sniper rifle with a good zoom in scope. You can grab a sniper rifle right after you finish your first main mission in the Itacua province. You will end up in the Itacua Echo fast travel location. There is a weapon case with a sniper rifle. This was my first sniper rifle I found and didn’t find any others for another 15 hours. So make sure to grab it. Now use your binoculars to mark any enemy, move 400 m or greater away from the enemy, and try killing him. You need to aim 2 – 3 cm higher when zoomed in, as the game compensates for projectile motion. Once the enemy is killed the trophy should unlock. To unlock this trophy you need to melee an enemy during the night. The game randomly changes between day and night. You can keep fast traveling between fast travel points to change between morning, evening, and night. Once it’s night, go to an enemy base camp or outpost, and melee (R3 ) him to get this trophy. You can even get this trophy as dawn is breaking so it’s pretty lenient. You need to be online and be playing in coop with atleast one other player. You can either join a buddy or invite others into your game. Now your coop partner has to shoot an enemy that is aware of your presence. If the enemy is unaware and you shoot him, it will count as a stealth kill meaning the enemy will die in one bullet. So make some ruckus and alert the enemies in the vicinity. Now your coop partner has to shoot the enemy with a pistol once, and you need to immediately melee (R3 button) the enemy right after the shot. This should unlock the trophy. In order to obtain this trophy, you need to buy the explosion drone skill in the drone skill tree. You only get access to this skill once you reach level 15. If you have other abilities equipped such as the noisemaker ability, you need to go the loadout screen and change the drone ability to the explosion ability. Now fly your drone towards an enemy, and unleash the explosion by pressing the R3 button. This should unlock the trophy. Make sure you are beside the enemy, as sometimes if they are beside objects the explosion will not kill the enemy. So it’s best to get really close to an enemy before exploding the drone. To get this trophy, you need to blow up a power generator using a C4. You can buy the C4 skill in the items skill tree to use it. Now head to any large enemy outpost or base and use your drone to scan the environment. You will eventually tag a generator marked by a lightning bolt icon. Go to the generator, throw a C4 onto it, walk away, and hold L1 to trigger the explosion. This should unlock the trophy. You can get the trophy when you reach the F.O.B. Armadillo base. It’s in the east most area of the Itacua province (starting region). If for some reason you accidentally destroyed the generator, or an enemy blows it up by accident, no worries. You can either go to another base, outpost or enemy camp. If you’re not up for the walk, fast travel to a close-by fast travel location, and come back. The generators and the enemies re-spawn every time you fast travel. Assault Rifle models are classified as a collectible in this game. You need to unlock all the different models to unlock this trophy. To unlock new weapons, you either need to beat bosses or find weapon cases that you can loot. They are extremely easy to find as you can get their locations to show up on your map (marked by a gun icon), by looking at intel files or interrogating sources with intel. Intel can always be found in enemy base camps, outposts and most named areas in the game. There are a total of 80 weapons in the game, where you can loot 50 in the open world and the 30 are given as rewards for beating/dealing with the bosses in the game. Each region has 2-4 weapon cases to be looted. You do not need to loot the accessory cases for this trophy. Once the locations of the gun icons show up on your map, you can highlight a specific collectible and it will show you what it is. It could be a weapon or a weapon accessory. This can save time as you can head straight to the locations of weapons and grab them. Once you collect your final assault rifle, this trophy should unlock.